Born Mahesh. The world knew him as Maharishi Mahesh Yogi. He was born Mahesh Prasad Varma. The place of birth given in his passport is "Pounalulla", India, and his birth date 12 January 1918. He studied physics at Allahabad University and earned a degree in 1942. One year earlier he had become a disciple of Swami Brahmananda Saraswati, the Shankaracharya (spiritual leader) of Jyotir Math in the Indian Himalayas. After finishing his studies, Mahesh became an assistant of his Guru Dev. In his position as Shankaracharya, Sri Brahmananda was the spiritual head for the Hindus in Northern India. He had already an ashram in Varanasi. Scores of disciples had come to the Varanasi ashram. While the ashram now became the official seat of the Shankaracharya, the Jyotir Math was rebuilt after long years of neglect of the property. As Shankaracharya, Sri Brahmananda travelled widely across India, sharing his wisdom and reviving the religious and spiritual traditions wherever he visited. Mahesh had got a honorific, Maharishi, "Great Seer", to his name about this time, and rose to world recognition. He did not claim to be any gurudev, and used to honour Guru Dev in several ways. The ceremony where people were given the TM technique, honours Guru Dev as the TM gurudev, not Maharishi. 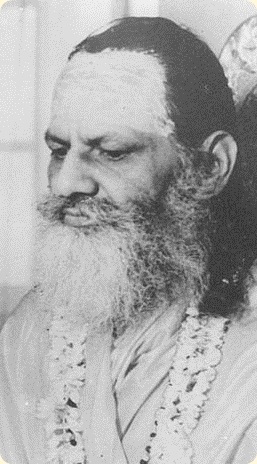 Maharishi did not fashion himself as a divine guru with personal followers; he served as a teacher of the TM technique and found it fit to include added programmes to it along the way too. Commisioned. Mahesh was commissioned to bring the age-old techniques of TM to the world. Guru Dev's disciple Dr. Raj P. Varma told Elsa Dragemark (1926–2011) that moments before Guru Dev passed away the 20th of May, 1953, he called Mahesh (who was a brahmachari, yogi-in-training then) and asked him to sit down. Guru Dev said there was one thing more he himself should have done, but did not have the time to carry through. Maharishi wondered what that could be, adding, "Tell me, so that I can fulfil it." Maharishi did not present himself as a guru or claim his teachings as his own. Instead he taught "in the name of his guru and paid tribute to him by placing a picture of Sri Guru Dev behind him when he spoke. Promulgating Transcendental Meditation. In 1955, Maharishi began to teach Deep Meditation (later renamed Transcendental Meditation) in his homeland, India. His first global tour began in 1958, in Rangoon (in today's Myanmar). Maharishi remained in the Far East for about six months teaching Transcendental Meditation. After 1958, Maharishi lectured, taught TM, developed TM Teacher Training Programs, toured the world a long time, authored books, appeared on TV shows, started organisations, established universities, research centres, alternative healing initiatives, and a city, Maharishi Vedic City. He established TM centres in several countries, and moved his headquarters some times, and finally to Vlodrop in the Netherlands. "Peace will come if we just hop." - Madision, Wisconsin Capital Times (in Pearson 2008:331). Maharishi's farewell. On 12 January 2008 – his birthday – Maharishi declared: "It has been my pleasure at the feet of Guru Dev (HH Brahmananda Saraswati), to take the light of Guru Dev and pass it on in my environment. Now today, I am closing my designed duty to Guru Dev." Dragemark, Elsa. The Way to Maharishi's Himalaya. Stockholm: E. Dragemark, 1972. Forem, Jack. Transcendental Meditation: The Essential Teachings of Maharishi Mahesh Yogi. Rev. ed. London: Hay House, 2012. Mason, Paul. 108 Discourses of Guru Dev: The Life and Teachings of Swami Brahmananda Saraswati, Shankaracharya of Jyotirmath (1941-53). Vol 1. Penzance, Cornwall: Premanand, 2009a. Mason, Paul. The Biography of Guru Dev: The Life and Teachings of Swami Brahmananda Saraswati, Shankaracharya of Jyotirmath (1941-53). Vol 2. Penzance, Cornwall: Premanand, 2009b. Mason, Paul. Guru Dev as presented by Maharishi Mahesh Yogi: The Life and Teachings of Swami Brahmananda Saraswati, Shankaracharya of Jyotirmath (1941-53). Vol 3. Penzance, Cornwall: Premanand, 2009c. Mason, Paul. Roots of TM: The Transcendental Meditation of Guru Dev and Maharishi Mahesh Yogi. Penzance, Cornwall, UK: Premanand, 2016. Pearson, Craig. The Complete Book of Yogic Flying: The Program of His Holiness Maharishi Mahesh Yogi to Enjoy Bubbling Bliss, Develop Total Brain Functioning and Higher States of Consciousness, Create National Invincibility and World Peace. Fairfield IA: Maharishi University of Management Press, 2008. Radin, Dean. Supernormal: Science, Yoga, and the Evidence for Extraordinary Psychic Abilities. New York: Deepak Chopra Books / Random House, 2013. Shriver, LB Trusty. The Sweet Teachings of the Blessed Sankaracarya Swami Brahmananda Saraswati.. Tr. and contr. Cynthia Ann Humes. Raleigh, NC: Lulu.com, 2013. ⍽▢⍽ Professor Humes translated the teachings and supplied the annotations. The Institute of Vedic City Planning of Maharishi University of Management. Maharishi Vastu. Architecture and Planning: Vastu City Planning: Sustainable Cities in Harmony with Natural Law. 4th ed. Roerdalen, NL: Maharishi University of Management, Institute of Vedic City Planning, 2013. Tiwari, Rameswar, compiler, LB Trusty Shriver and Cynthia Ann Humes, eds. Rocks Are Melting: The Everyday Teachings of Swami Brahmananda Saraswati Fairfield, IA: Clear River Press, 2000. ⍽▢⍽ Scanned hard-copy manuscript, with annotations. A good source. Yogi, Maharishi Mahesh. The Science of Being and Art of Living. Rev ed. London: Penguin/Plume, 2001. WP. Wikipedia, the free online encyclopedia, sv. "Maharishi Sthapatya Veda"; "Maharishi Mahesh Yogi"; "Consciousness-Based Education"; "Maharishi University of Management"; "Transcendental Meditation technique"; "TM-Sidhi"; etc.